In a paper – Fiscal Policy, Monetary Policy and Central Bank Independence – delivered to the Jackson Hole Economic Policy Symposium, hosted by the Federal Reserve Bank of Kansas City, last week (August 25-27, 2016), Princeton University academic Christopher Sims suggested that monetary policy effectiveness cannot be judged independent of the fiscal position taken by the government. He argued that the current reality has demonstrated that when central banks shift to very loose monetary policy settings these policy changes will be ineffective if the fiscal authorities are simultaneously pursuing austerity. Even conservatives like Christopher Sims are starting to understand that the dominant mantra that places all policy responsibility on central banks and, meanwhile, pursues fiscal austerity, represents a failed and deeply flawed overall strategy. That is, the core neo-liberal macroeconomics strategy is now being shown by conservatives to be ridiculous. Modern Monetary Theory has long argued that monetary policy has to work hand-in-glove with fiscal policy and if the central bank is cutting interest rates then the fiscal authority has to be increasing its fiscal deficit to make the policy changes stick. Some of the more enlightened conservative economists are now seeing this reality. … monetary policy effectiveness requires that at high inflation rates, interest rate rises generate fiscal contraction and that at low inflation rates interest rate declines generate fiscal expansion. The persistence of low inflation and low interest rates is not a surprise when, as has been true in fact, the low interest rates fail to generate substantial fiscal expansion. He was trying to enrich the usual narrative pumped out by Paul Krugman and the New Keynesians that monetary policy has ‘run out of ammunition’ because interest rates are stuck at the so-called “zero lower bound”. His insight is that at the same time as nominal interest rates have hit the zero lower bound, governments have been pursuing contractionary fiscal policy. In Europe, the emphasis on austerity has been explicit and widespread … In Japan … a substantial increase in the consumption tax was introduced before the inflation target was reached. In the US it has been less clear what philosophy guides fiscal policy, which perhaps explains its relative success in approaching its inflation target. In other words, the US deficit has remained more supportive of growth, largely (in my view) because the polity is so dysfunctional that the crazy Republican and Blue Democrats have not been able to succeed in implementing their plans for a wholesale fiscal massacre. So, by default, the US has maintained a more supportive fiscal environment. Reductions in interest rates can stimulate demand only if they are accompanied by effective fiscal expansion … if interest rates are pushed into negative territory, and the resources extracted from the banking system and savers by the negative rates are simply allowed to feed through the budget into reduced nominal deficits, with no anticipated tax cuts or expenditure increases, the negative rates create deflationary, not inflationary, pressure. This has been a position that Modern Monetary Theory (MMT) authors have been maintaining for two or more decades. Falling interest rates are meant to reduce the cost of borrowing. But investment and production decisions taken by firms are influenced by the expectations that entrepreneurs form about future revenue, in addition to cost streams, which allow them to make guesses about what their profits might be. Firms are continually making guesses about the future in terms of what the overall state of demand for their products will be, what they are likely to receive by way of revenue if their sales match these expectations, and what it will cost them to produce the output necessary to meet this demand. Investment decisions will thus depend on whether the productive asset being purchased delivers a positive return above the cost. It is clear how the imposition of fiscal austerity will undermine investment plans irrespective of what is happening to the cost of finance. Firms will not invest in new productive capacity if they can satisfy current sales with their existing capacity and expect sales to be flat or falling in the period ahead. This reasoning also helps us understand why investment can grow even when interest rates are rising. In a growing economy, it is likely that aggregate spending conditions will improve at times when the market rate of interest rises. The former will improve the revenue cash flows over time and increase the profitability for each project. In other words, we would not observe investment falling when the market rate of interest rose because the internal rate of return of each project could also be increasing. Thus it is important to avoid applying a mechanical interpretations that investment will decline (rise) when interest rates rise (fall). John Maynard Keynes who spent a lot of time hypothesising about the role of expectation in forming investment plans, did not think investment would be very responsive to changes in the market rate of interest, especially when the economy was in recession or boom. When the economy was in recession, entrepreneurs would become pessimistic and this would negatively impact on their assessment of the future returns from different projects. Further, with substantial excess productive capacity firms are unlikely to expand the capital stock even if new investment projects become cheaper as the central bank cuts the market interest rate to stimulate demand. The extreme optimism that typically accompanies a boom also would reduce the sensitivity of investment to changes in the market rate of interest. With expected returns high, firms will be prepared to pay higher borrowing costs. Similarly, household expenditure on consumer durables (for example, white goods, motor vehicles) might be affected by variations in interest rates other things equal. Those other things equal, importantly, include the expectations of employment continuity and income growth. If households are faced with employment uncertainty as fiscal austerity drives up unemployment then they are unlikely to borrow at any cost. Fiscal expansion can replace ineffective monetary policy at the zero lower bound. So long as the legislature has no clue of its role in these problems, nothing is going to get done. Of course, convincing them that they have a role and there is something they should be doing, especially in the U.S., may be a major task. Such is the neo-liberal Groupthink that is paralysing sensible fiscal intervention while growth rates slow dramatically. So, while Sims is not an MMT-inspired economist, his understanding of the crucial dependence of monetary policy on the fiscal position taken by the government, allows him to oppose the neo-liberal orthodoxy where central bankers continue to maintain they have all the answers and that ‘budget repair’ (meaning austerity) should be the sole concern of fiscal authorities. The narrative talks about ‘growth-friendly austerity’ to try to smooth-talk the fact that fiscal authorities will be scorching the earth and, as Sims correctly notes, providing no room for monetary policy to function effectively (even if the transmission mechanisms linking interest rates to aggregate spending work in the way mainstream macroeconomists think they do). Bloomberg journalist Mark Gilbert touched on the central bankers on-going claims that they are the important players in the picture in his article (August 31, 2016) – Fed Harmony Hides the Dangers of Groupthink. There’s a consensus that monetary policy is becoming impotent, and that governments need to step in with fiscal stimulus. But until central banks admit that their firepower is waning, politicians can continue to evade responsibility … there’s a bias for central banks to always express complete confidence in whatever policies they are currently pursuing so as not to frighten the horses … by pretending to still be in control of the global economic machine with their current toolbox, central banks are doing both us and themselves a disservice, letting governments off the hook. So it is a case of central bankers struggling to avoid attention deficit disorders. They have been so pumped up as the saviours that they will resist any notion that their roles are ineffective. That is a classic Groupthink response. Their primacy was, of course, without any justification in fact. It reflected the ideological need by neo-liberal elites to reduce the policy discretion of elected governments and provide a more stable environment for capital to extract ever larger shares of national income. That has allowed these elites to move further on in their agenda of control and the awful (so-called) free trade agreements are the latest manifestation – subjugating democratic governance to corporate whim and interests. The need to ensure that monetary and fiscal policy work together is exemplified by the proposals to implement Overt Monetary Financing (OMF) and for governments to stop issuing debt to the non-government sector to match their deficit spending. This is a key MMT approach (in my view) and directly confronts the neo-liberal taboo which has convinced policy makers that OMF would be highly destructive. Overt Monetary Financing (OMF) simply means that in some form or another, the treasury arm of government tells the central bank arm of government that it wants to spend a particular amount and the latter then ensures those funds are available in the government’s bank account for us. Various accounting arrangements might accompany that action. For example, the treasury might sell the central bank debt some government bonds which match the value of the funds put in the government’s bank account. … the fact that central banks can create money out of thin air … [a capacity he thinks] … many observers are likely to find surprising and strange, perhaps mystical and dreamlike, too – or even nightmarish. Always finish by promoting the taboo! While MMT authors promote OMF – and I will be giving one of two presentations at the upcoming – International Post Keynesian Conference – on the topic, the idea of policy coordination is not at all new. In 1943, Abba Lerner produced one of the best 14 pages ever written by an economist. The article – Functional Finance and the Federal Debt – appeared in the journal Social Research, Vol 10, pages 38-51. In recent years the principle by which appropriate government action can maintain prosperity have been adequately developed, but the proponents of the new principles have either not seen their full logical implications or shown an over-solicitousness which caused them to try to save the public from the necessary mental exercise. This has worked like a boomerang. Many of our publicly minded men who have come to see that deficit spending actually works still oppose the permanent maintenance of prosperity because in their failure to see how it all works they are easily frightened by fairy tales of terrible consequences. In this article, Lerner was seeking to elucidate the idea of the “new fiscal theory” (of Keynes etc) – “to pose the theorems in the purest form” so as to tease out “all the unorthodox implications”. He was writing at a time when there was scepticism in the academy about the new ideas, which he suggested were “extremely simple” but which “learned professors who find it hard to abandon ingrained habits of thought” had tried to make more complicated by “dressing it up to make it more complicated and accompanying the presentation with impressive but irrelevant statistics”. The central idea is that government fiscal policy, its spending and taxes, its borrowing and repayment of loans, its issue of new money and its withdrawal of money, shall all be undertaken with an eye only to the results of these actions on the economy and not to any established traditional doctrine about what is sound or unsound. He called this principle Functional Finance. … first financial responsibility of the government (since nobody else can undertake that responsibility) is to keep the total rate of spending in the country on goods and services neither greater nor less than that rate which at the current prices would buy all the goods that it is possible to produce … the government can increase total spending by spending more itself or by reducing taxes so that taxpayers have more money left to spend. And the same in reverse. He says that sometimes the government might run a surplus and at other times a deficit and in “neither case should the government feel that there is anything especially good or bad about this result; it should merely concentrate on keeping the total rate of spending neither too small nor too great, in this way preventing both unemployment and inflation”. 1. Taxation is not undertaken “merely because the government needs to make money payments” and the government can get more money to spend more easily by “printing money”. 2. The only purpose of bond issuance is if it is deemed “desirable that the public should have less money and more government bonds, for these are the effects of government borrowing. This might be the situation if those who are holding cash decide to “lend it out … and induce too much investment”. … we calm ourselves and take note that this printing does not affect the amount of money spent. That is regulated by the first law of Functional Finance, which refers to inflation and unemployment. In other words, it is spending that creates the inflation risk. And as long as total spending is at the appropriate level specified above, then “printing money” will be an appropriate accompaniment to total government spending. … Functional Finance rejects completely the traditional doctrines of “sound finance” and the principle of trying to balance the budget over a solar year or any other arbitrary period. The point to note is that the inflation risk lies in the spending not the monetary operations (debt-issuance etc) that might or might not accompany the spending. All spending (private or public) is inflationary if it drives nominal aggregate demand faster than the real capacity of the economy to absorb it. Increased government spending is not inflationary if there are idle real resources that can be brought back into productive use (for example, unemployment). Related propositions include the claims that issuing bonds to the central bank, the so-called ‘printing money’ option, devalues the currency whereas issuing bonds to the private sector reduces the inflation risk of deficits. Neither claim is true. First, there is no difference in the inflation risk attached to a particular level of net public spending when the government matches its deficit with bond issuance relative to a situation where it issues no debt, that is, invests directly. Bond purchases reflect portfolio decisions regarding how private wealth is held. If the funds that we used for bond purchases were spent on goods and services as an alternative, then the budget deficit would be lower as a result. Second, the provision of credit by the central bank (in return for treasury bonds) will only be inflationary if there is no fiscal space. Fiscal space is not defined in terms of some given financial ratios (such as a public debt ratio). Rather, it refers to the extent of the available real resources that the government is able to utilise in pursuit of its socio-economic program. Further, hyperinflation examples such as 1920s Germany and modern-day Zimbabwe do not support the claim that deficits cause inflation. In both cases, there were major reductions in the supply capacity of the economy prior to the inflation episode. Paul McCulley, former managing director of the large bond trader PIMCO, co-authored a research report in January 2013 – Helicopter money: or how I stopped worrying and love fiscal-monetary cooperation – which argued convincingly that the emphasis on monetary policy alone as the vehicle to resolve the crisis was ineffective, especially with fiscal policy being forced to take on a pro-cyclical stance due to the imposition of austerity. This is the same point that Christopher Sims was making last week in Jackson Hole. It is the core point that MMT authors have been making for more than 2 decades. Voices take a long time to be heard – as Abba Lerner reminded us of above (many years ago). Groupthink is almost impenetrable from the outside. McCulley and Pozsar argued that the correct policy response in circumstances of low or falling inflation and massive spending shortages is to ensure “monetary stimulus is paired with fiscal stimulus”, a coincidence they referred to as a “helicopter drop”. From the perspective of MMT, a ‘helicopter drop’ is equivalent to an increase in the fiscal deficit in the sense that new financial assets are created and the net worth of the non-government sector rises. This is in contradistinction with QE, which just swaps assets in an existing non-government asset portfolio. McCulley and Pozsar consider that “unconventional and radical policies” (p.16) such as QE and similar policies are not effective because they are “independent of the fiscal policy stance”, and so the imposition of fiscal austerity kills any growth potential that these monetary policies might have. Instead, they propose that monetary policy has to go “nuclear” (p.16) (reflecting the strength of the taboo) as part of what they call, “fiscal-monetary cooperation (‘FMC’)” (p.16). FMC means that monetary policy works to “support the fiscal authority in raising nominal demand, not to stimulate private borrowing per se” (p.17) by funding the deficit. They qualify their support for this policy option by suggesting that to overcome what they call technical constraints (by which they mean the voluntary constraints that force governments to issue debt to the private sector), the central bank can “underwrite government spending … by buying on the secondary market the same amount of bonds that the government has issued to fund the stimulus” (p.18). From an Modern Monetary Theory (MMT) perspective, the preferred approach would be to eliminate any of the voluntary constraints on central banks so they could directly underwrite the fiscal deficits without the need for governments to engage in primary issuance of debt to the private markets. 1. OMF – paranoia for many but a solution for all. 2. Overt Monetary Financing would flush out the ideological disdain for fiscal policy. 3. The Bank of Japan needs to introduce Overt Monetary Financing next. The Australian Bureau of Statistics released two important date series today (September 1, 2016), which makes one think that Winter didn’t disappear yesterday! The – Retail Trade, Australia – data for July 2016 showed that current price estimates of retail trade turnover for July 2016 were unchanged on the previous month. That is, no growth at all. The ABS note that “This follows a rise of 0.1% in June 2016 and a rise of 0.1% in May 2016”. Trend turnover is racing downwards. 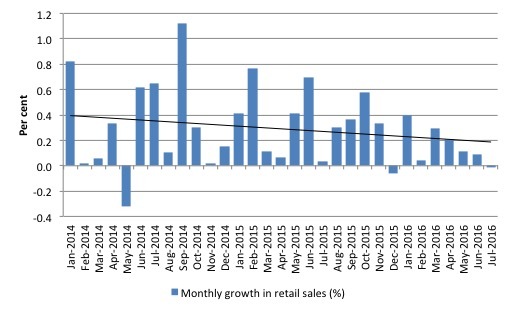 The following graph shows the monthly growth in retail sales since January 2014 (to June 2016) with the solid black line being the simple linear trend. In volume terms, seasonally-adjusted retail sales rose by just 0.4 per cent in the June-quarter 2016. The average quarterly rate of growth since the March-quarter is 0.85 per cent. So, in real terms, the current rate of growth is less than 50 per cent of the longer term trend. What accounts for the difference? The current-price estimates incorporate the inflation (price level) effect and with inflation at negative or very low levels, that has suppressed the growth in retail sales. This is further evidence of the ineffectiveness of monetary policy. The Reserve Bank of Australia has been cutting rates towards zero for some time now. On August 2, 2016, the RBA cut the policy cash rate by a further 25 basis points to 1.5 per cent. This is the lowest rate on record and follows cuts two similar cuts since the beginning of the year. … debt burden … is already high. It is for this reason that I have previously noted some reservations about how much monetary policy can be expected to do to boost growth with lower and lower interest rates. So no surprises that retail sales have failed to respond to the lower interest rate environment, which is really a reflection of the RBAs desperation to try to do what it knows it cannot – kickstart spending – and the failure of the Government to take responsibility and provide the necessary fiscal stimulus. Another contributing factor to the stagnant retail sales outcome is the static wages situation in Australia. Depending on how one measures it, real wages growth has either been around zero or falling. The wage share continues to shrink and the business firms will not invest if sales are slow. Business investment is in dramatic decline, in fact. Further, households are not only labouring under record debt levels but unemployment and underemployment remain at elevated levels and employment growth has been close to zero for the last few years. All of these negative trends are linked directly to the failure of the government to take responsibility and to use its fiscal capacity to stimulate growth. The situation is screaming out for a major fiscal intervention in Australia and elsewhere. The other important economic data that the ABS released today was its quarterly – Private New Capital Expenditure and Expected Expenditure, Australia – for the June-quarter 2016, which will feed into next Wednesday’s release of the National Accounts for that quarter. A so-called ‘interest-sensitive’ component of aggregate spending heading south at a rate of knots despite the sharp reductions in interest rates. Today’s release confirms what we have been expecting for a year or more – with real total new capital expenditure falling by 17.4 per cent in the 12 months to June 2016, investment in Building and structures falling by 25.6 per cent over the same period, and investment in Equipment, plant and machinery falling by 3 per cent. In the June-quarter 2016 alone, real total new capital expenditure fell by 5.3 per cent. Expected investment for 2015-16 is now 15.4 per cent lower than the equivalent figure 12 months. 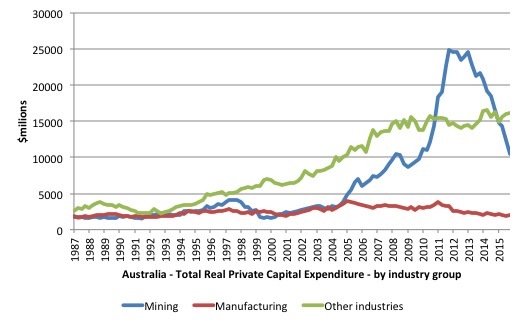 Here are two graphs produced from Table 3B, the first showing real private capital expenditure by broad sector from the September-quarter 1987 to the June-quarter 2016. The boom and bust in the Mining sector is quite extraordinary in historical terms. 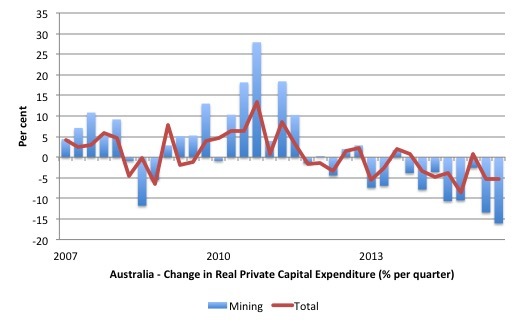 The second graph shows the quarterly percentage change in Total and Mining private capital expenditure in real terms from the December-quarter 2007 to the June-quarter 2016. Capital formation has declined in six of the last seven quarters and the rate of decline remains high. There is clearly little confidence as consumer expenditure remains tight and the government’s attempt to impose austerity hacks into spending (and sentiment). Total expected expenditure on capital formation for 2015-16 is now 15.4 per cent lower than the firms indicated for 2014-15 although the expected decline has been reduced over the last three months. Total expected expenditure on Buildings and structures for 2015-16 is now 21 per cent lower than the firms indicated for 2014-15. Total expected expenditure on Equipment, plant and machinery for 2015-16 is now 5.1 per cent lower than the firms indicated for 2014-15. – A longer term expectation (E2). – the final (or seventh) estimate from the June quarter 2016 survey is derived from the sum of the actual expenditure for each of the four quarters in the 2015–16 financial year. As a result we get the following graph of Total Capital Expenditure (black columns) and Expected (clear columns), which allows you to trace the shifting expectations of expenditure (the plans) and what actually transpires. It is clear that expected (planned) private investment expenditure for 2015-16 was significantly lower than it was in 2014-15 and that decline has been realised. The forward-looking plans also signal a further decline in investment although the rate of arrest has slowed. In the Australian Parliament at present is a so-called Omnibus Bill designed to cut around $A6 billion in net public spending. Notwithstanding that the government cannot seem to correctly add up to present the correct figure they are trying to hack out of the aggregate spending stream (with greater multiplied effects), it is clear that if they are successful in getting this through the legislative process, it will further undermine economic prosperity in Australia. Fiscal policy has to be expansionary at present – that is a fact – given all the data trends being realised. Even conservatives like Christopher Sims can now see that monetary policy has to work hand-in-glove with fiscal policy and if the central bank is cutting interest rates then the fiscal authority has to be increasing its fiscal deficit to make the policy changes stick. I agree with Bill. Herewith a few additional points. Milton Friedman also advocated a close relationship between fiscal and monetary stimulus. At least in his 1948 American Economic Review paper “A Monetary and Fiscal Framework…” he advocated a fixed annual budget deficit, which as he pointed out, necessarily results in an increase in the stock of base money. So for every dollar of fiscal stimulus, he effectively advocated a dollar of monetary stimulus. Maybe, finally, a crack in the Groupthink wall! The conservatives will have to claim it was all their doing, all their invention. And deny, simultaneously, any responsibility for four decades of hogwash economics. Unfortunately I just got a notification about this …..
Why do you delete the links to Positive Money material? Another major failure of monetary policy is the gold standard thinking that reducing rates reduces the exchange rate. Reducing interest payments ie. New money creation actually reduces the dollars in circulation and actually raises the exchange rate is deflationary. The immediate reaction is wrong on forex due to old gold thinking but if you watch exchange rates you’ll see how our rates have risen. Literally nobody realises this simple fact. Negative interest rates are also deflationary so don’t get me started on that disaster of an idea and things like the ECB buying high paying bonds etc removing even more new money from the system. What a disaster mainstream economics is. I do not agree with the principles of PM and therefore do not wish to send traffic to their sites.